Julia Child is my hero. She was 6’2” tall. She wore a size 12 shoe. She volunteered for the OSS during WWII and traveled the world contributing to the war effort. She didn’t even think about starting to cook until she was 32 years old. She loved everything French (me too!). Her groundbreaking cookbook–“Mastering the Art of French Cooking”–and her cooking show on public television infinitely changed the way Americans cooked and ate. How does this relate to the history of psychology? Well, psychologists and historians like to eat too! Who doesn’t love to support a colleague at a honorary dinner or enjoy a good meal with friends after a day of conference meetings? 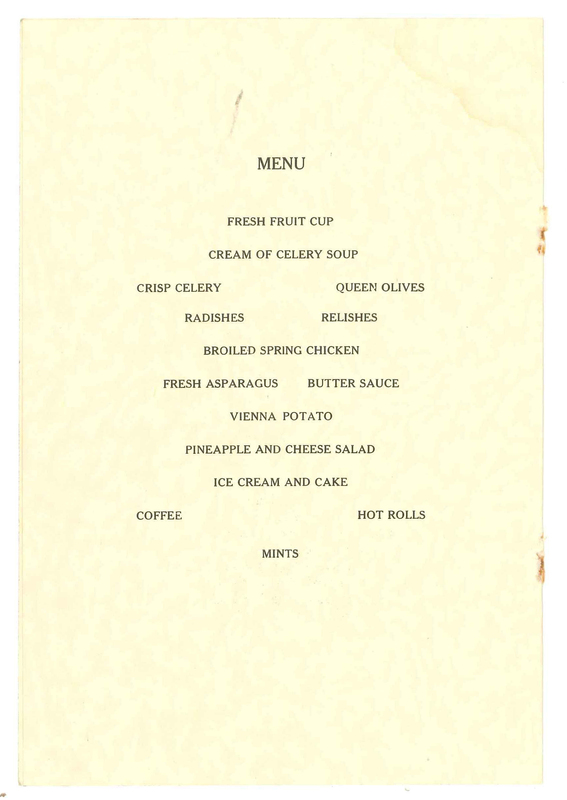 I did a quick search for menus across our archival manuscript collections and here are a few of our favorites. Experimental psychologist Walter R. Miles kept meticulous diaries and journals detailing his attendance at various conferences and meetings across the U.S. and abroad. He adhered postcards, train tickets, conference schedules, and even menus to the pages of his notebooks. 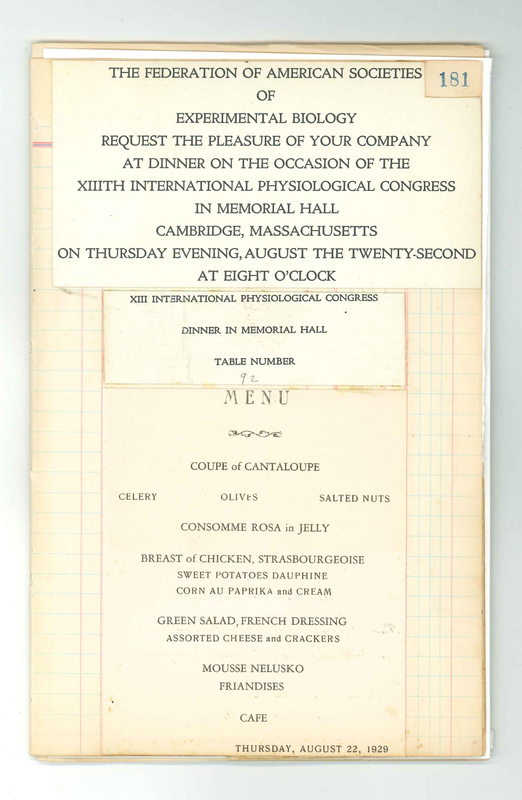 Here is the menu from the XIII International Physiological Congress held in Cambridge, MA in 1929. Sweet potatoes Dauphine? I think Julia would have approved! Applied psychologist Edgar Doll worked as the Director of Research at the Vineland Training School in Vineland, NJ from 1925-1949. 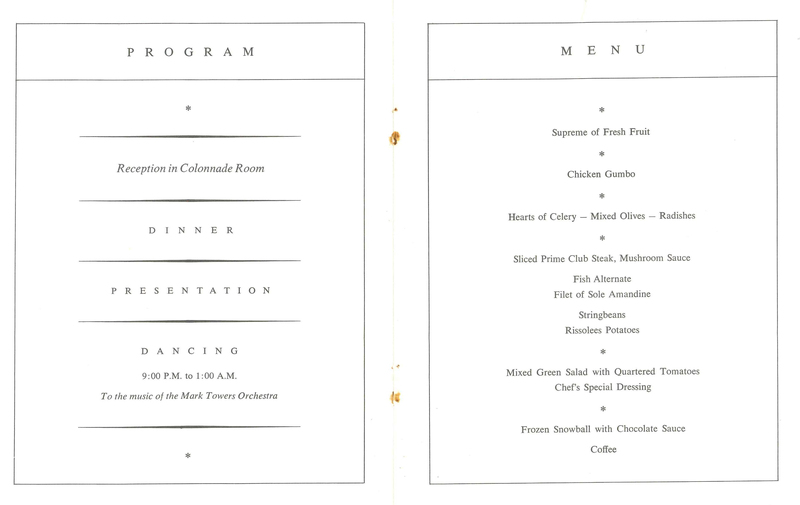 The Research Laboratory was established by Edward R. Johnstone in 1906 and the menu shown here was served to guests at a 1938 testimonial dinner in his honor. Who doesn’t love ice cream and cake? 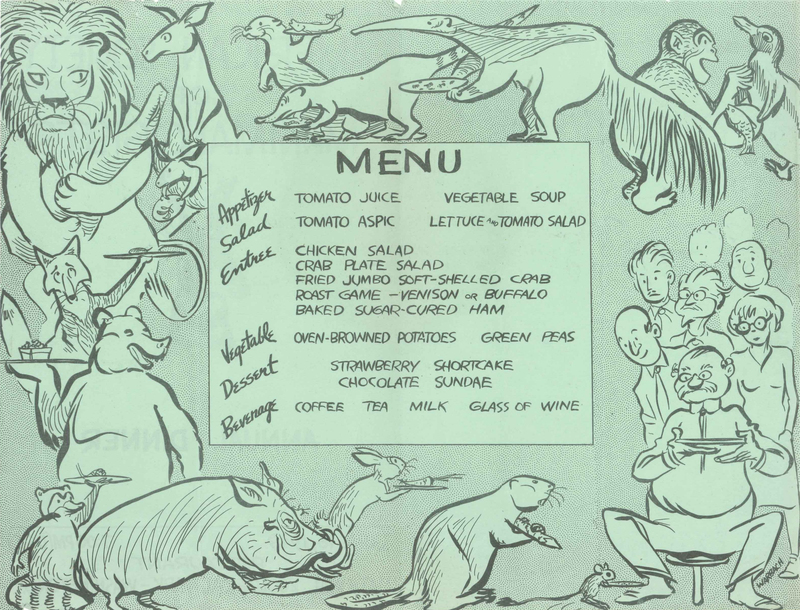 Comparative psychologist T. C. Schneirla attended the annual dinner of the American Society of Mammalogists at the National Zoo in Washington DC in 1949. Roast game at the zoo? Absolutely! Clinical psychologist Molly Harrower attended the 1965 Samuel Rubin Foundation Dinner in honor of that year’s award winner Robert H. Felix. The dinner was held at the Delmonico Hotel in New York City which was recently showcased on NPR’s Planet Money. Another cool thing about this menu – the “fish alternative” was filet of sole amandine. Not quite sole meunière, Julia’s life altering first meal in Paris, but sole nonetheless. And there was dancing afterwards!